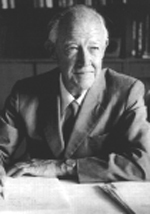 Bayliss, Noel Stanley 1906-1996 - Component of : Early Ideas in the History of Quantum Chemistry. Photo and © here. 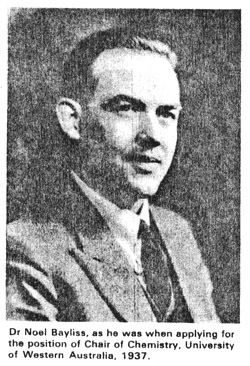 Noel Stanley Bayliss was born in Brisbane, Australia, in 1906. He entered the University of Melbourne in 1924, enrolling for a science course majoring in chemistry and metallurgy, though in his second year he switched to a joint major in chemistry and physics, which involved him studying the whole year's course in Mathematics II during the third term. In 1927 Bayliss obtaained a Fellowship and chose Lincoln College at Oxford because there he would be under the guidance of N.V. Sidgwick. He studied in Munich in 1928, travelled widely in Germany and Austria. In 1930 he started postdoc work at the Berkeley Caltech, returning to Melbourne in 1933 till 1937 as a lecturer. In 1938 he went to the University of Western Australia which was at that stage a small place, the staff numbered three people. Wartime activities from 1940-1945. While reading a review paper by Mulliken and Rieke  that discussed the intensities of absorption spectra of long-chain conjugated organic compounds, a new idea formed in his mind. This was to consider that the spectrum due to the excitation of the -electrons could be related to the quantum mechanical problem of the 'electron in a one-dimensional box'. It was already widely known that the -electrons could move freely along the system of conjugated double bonds, and the theoretical energy levels of an electron oscillating in a box with a vertical potential profile at each end had already been analysed. The novelty of his approach lay in using the known bond lengths in the conjugated molecule to define the length of the box. When he first did the simple calculations he was surprised at the good agreement between the theory and experiment for the positions and intensities of the spectra of simple polyenes. This surprise made him wonder whether such a simple theory could be true, but after his initial hesitation, he published the results in the Journal of Chemical Physics. The paper was immediately followed by others by H. Kuhn of Zurich  and W. Simpson of Berkeley  who had had similar thoughts quite independently. The free-electron model caused a brief flurry of attention; it was attractive in its simplicity and it emphasized the mobility of the -electrons in a conjugated chain. But Bayliss knew it was obviously too simple and could be no more than an approximation to reality. During the next few years he experimented with slightly more sophisticated versions of the FE model, in part with the assistance of John Riviere, an honours student. However, by the early 'fifties it was clear that the future of that kind of work lay with the electronic computers that were beginning to be available in a few major centres, but certainly not in Western Australia, and he discontinued free-electron calculations in favour of other interests. Following his earlier work with Rees in Melbourne, Bayliss took up a prolonged study of the manner in which the positions and intensities of absorption bands are affected by having the absorbing species surrounded by solvent molecules. The shifts in the wavelength of maximum absorption were first interpreted in terms of the dielectric constant and refractive index of the solvent. Then, with one of his research students, Eion McRae, the theory was extended to give what Jaffé and Orchin  called 'a general and comprehensive treatment of solvent effects on spectra'. It gave a qualitative account of these effects in terms of dipole, polarisation and hydrogen-bonding forces. Overall, they concluded that superimposed on the 'polarisation red shift' (i.e. a shift towards longer wavelengths due to dispersion forces) are other shifts due to the fact that the solute molecule, in accordance with the Franck-Condon principle, at the instant of excitation is not in equilibrium and is therefore in a state of strain with respect to its environment. This strain can be related partly to the polarity of the solute and solvent molecules, and to changes in the dipole moment of the solute during the transition, and partly to packing strain arising from changes in the dimensions of the solute due to the absorption and excitation. McRae  later applied second-order perturbation theory to the problem and came up with a more elaborate formulation that took account of dispersion forces, solute dipole-solvent induced dipole interactions, permanent dipole-dipole interactions and the Stark effect. The Bayliss-McRae model has become one of the most popular theories of solvent effects, and many studies have confirmed its applicability. Over the years, a number of other papers resulted from the study of various solvent-solute systems, and from the application of spectroscopic measurements to systems containing nitrates and nitrites. Copyright © Febr. 09, 2003 by U. Anders, Ph.D.